Cleans teeth around braces and other orthodontic appliance. Colgate orthodontic brush has a unique 3-Way Bristle System which effectively removes plaque especially between teeth and at the gum line. 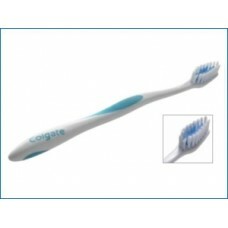 The long angled outer bristles gently massage while they remove plaque from gum line. Shorter inner bristles clean tooth surfaces, between braces and around brackets and wires and the long middle bristles reach deep between teeth. The bristles are end-rounded to protect tooth enamel and gums during orthodontic banding. Use twice daily with recommended toothpaste. Please read instructions carefully on package before use.